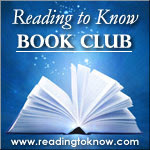 This month Bluerose's Heart is hosting the Reading to Know Book Club. Her book of choice was The Girl Who Circumnavigated Fairyland in a Ship of Her Own Making , by Catherynne M. Valente. You can read her complete thoughts below. I include my own thoughts below hers. 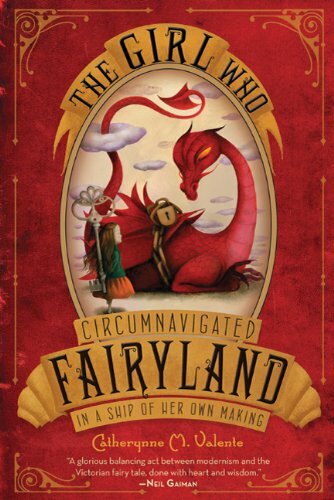 When I first saw the pictures in The Girl Who Circumnavigated Fairyland in a Ship of Her Own Making , they reminded me of Tim Burton. That alone convinced me I needed to read it! Despite the fact that it's completely out of character for me, I'm a huge fan of the "child friendly" Tim Burton. After reading the book, I have to say that the writing and story also remind me of him, so there's brownie points for that. He's been pretty lonely in my "wonderfully weird" category until now. "Once upon a time, a girl named September grew very tired indeed of her parents' house, where she washed the same pink-and-yellow teacups and matching gravy boats every day, slept on the same embroidered pillow, and played with the same small and amiable dog." I can't say I enjoyed everything about the book. Besides things like the witch sisters who share a husband, and the mention that humans evolved from monkeys, there's also the unique writing style. I had a love/hate relationship with it. It seemed to take me forever to read this book, despite its short length. When I was actually immersed in the story, I greatly enjoyed it! Once that bookmark hit the pages, though, I found it difficult to pick back up. The writing style was hard for me at times, and I kept re-reading passages in an attempt to better pick up on its quirkiness. That said, I also liked the quirky writing style! It was fun and creative. It's exactly the thing that earned my very rare "wonderfully weird". Going along with the quirkiness, the story is told with somewhat of a "campfire narration". I had neutral feelings about that particular aspect, but I could easily see where someone would find it annoying. We get to see things happening and know little secrets that September doesn't know about. "Being careful and clever readers, you must now wonder if your wool-gathering narrator has completely forgotten the jeweled key that so loyally followed September into Fairyland. Not so! But a key's adventuring is of necessity a quieter thing than a girl's, more single-minded and also more fraught with loneliness." Overall, I liked it. I'm looking forward to reading the next book in the series (which I only learned about last week), but I'll probably wait until I have a little more brainpower to devote to it. I had zero expectations for this book when I launched into it. The title was clever and certainly intriguing. I purchased a copy ok specifically for this month's book club read and got about a chapter into it when Jonathan and I went for a mini vacation. I took this book along and somehow managed to lose it (which strikes me as virtually impossible given the fact that I never took it out of the suitcase but there's the truth of the matter!). I didn't really want to purchase an additional copy so I thought I would wait and see what the general consensus of the book was from those of you who read it. I've gathered from a few of you that it wasn't much cared for. My thoughts on the first chapter were as follows: "Oh no. It's another author trying to be clever and zany. Feels forced. I'm not sure I'm going to like this." After reading Bluerose's thoughts I'm pretty sure I won't be picking it back up. Definitely appreciated the link in style to Tim Burton! That helps me out. (I've never much liked him.) I think you either like Burton or you don't. I'm not a fan myself so I'll skip it. That said, I really do appreciate Bluerose taking the time to read and present this book to us. Thank you very much! It's good to be aware of these titles and what the stories are about sometimes, even if we don't get around to reading them for ourselves. The discussion will be led by Stephanie of Stephanie's Mommy Brain. You have until Friday, September 28th to read this book. Confession--made it through a couple of chapters but couldn't go any further. And I bought my copy, too! I have a couple of chapters left - this month has been busy in the evenings for either me or the kids far too much. I'll post my review soon. I had high expectations, but then I read "Tim Burton" and lost them. I don't care for him either. It wasn't at my local library so I didn't get it. I have vowed not to buy anymore books until I read the 100 or so books on my shelf that haven't been read yet. Sounds like a good thing I didn't purchase it. I made it about halfway and fizzled out. I just couldn't keep up with the storyline. I like eccentric/fairytale-ish, but this was a wee bit much for me. Hey everyone! You really ought to go read Tim's post. It may change your mind or make you feel less awkward around the book. It changed my impression a bit! Isn't it amazing what a great review can do?! (Just like many of yours!) I was really starting to dwell on all the bad things about the book, but Tim did an awesome job of bringing to life all the wonderful things I DID enjoy. I'm actually looking more forward to the 2nd book now, although I'll still wait for more brainpower! I agree, though, everyone needs to go read Tim's post.